Sometimes it doesn’t take a lot to understand why an artist is massively successful. 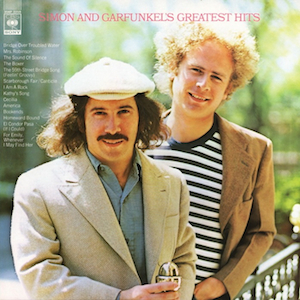 Taking elements of folk music and making it relevant for an audience experiencing the swinging 60s made Paul Simon one of the era’s defining songwriters and, alongside Art Garfunkel, the pair became some of the voices of the generation. Their harmonies continue to astound half a century on, especially on a traditional song like Scarborough Fair, which makes the inclusion of live performances of certain songs here make sense. Art Garfunkel’s live solo performance of For Emily, Wherever May I Find Her is especially haunting and sits alongside the jaunty opener Mrs Robinson surprisingly well. Of course there are more of these more sing-along tracks, closer Cecilia makes a nice bookend for the opener, but I’m much more drawn to the more emotive and sometimes darker tracks that really showcase Paul Simon’s song writing. Debut single The Sound of Silence is a subtle joy, but is steeped with intricate detail in its lyrics, while The Boxer is a much more expansive-sounding record where you can hear the painstaking hours it must have taken to create the sound. It’s this contrast between the acoustic harmony driven songs like Homeward Bound and the huge scale production we hear on the likes of Bridge Over Troubled Water that make this a Greatest Hits that shows off everything that made the duo so successful. The high points are very high and while for me the quality of the tracks starts to wane by the end of the second side, it’s a brilliant document of one of the industry’s most well loved duos. Will I listen again? : Definitely. Best Track: After listening back to these songs over and over the one that resonated with me the most was The Boxer. The closing minutes of that song are tremendous. Tags: Art Garfunkel, Bridge Over Troubled Water, Paul Simon, Simon & Garfunkel, The Boxer, The World's Greatest Hits. Bookmark the permalink.